In this study, we report the simultaneous use of gold and silver nanoparticles to set a multicolor multiplex lateral flow immunoassay (xLFIA). Silver nanoparticles (AgNPs), spherical in shape and characterized by a brilliant yellow color, were obtained by a new viable one-step synthetic protocol. AgNPs were stable over time and acceptably robust to conditions used for fabricating LFIA devices. These AgNPs were employed as a colorimetric probe in combination with two different kinds of gold nanoparticles (AuNPs) to set a visual xLFIA for detecting allergens. Surface plasmon resonance peaks of probes (AgNPs, spherical and desert rose-like AuNPs) were centered at 420, 525, and 620 nm, respectively. Therefore, the xLFIA output was easily interpreted through a “yellow magenta cyan (YMC)” color code. The prospect of the YMC xLFIA was demonstrated by simultaneously detecting three major allergens in bakery products. Antibodies directed towards casein, ovalbumin, and hazelnut allergenic proteins were individually adsorbed onto metal nanoparticles to produce three differently colored specific probes. These were inserted in a LFIA comprising three lines, each responsive for one allergen. 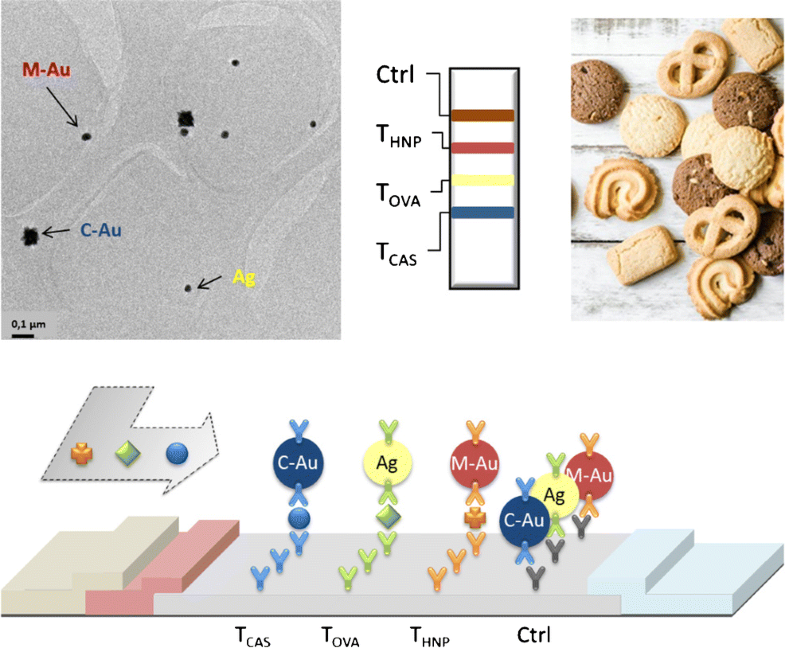 The trichromatic xLFIA was able to detect allergenic proteins at levels as low as 0.1 mg/l and enabled the easy identification of the allergens in commercial biscuits based on the color of the probes. The online version of this article ( https://doi.org/10.1007/s00216-018-1451-6) contains supplementary material, which is available to authorized users. 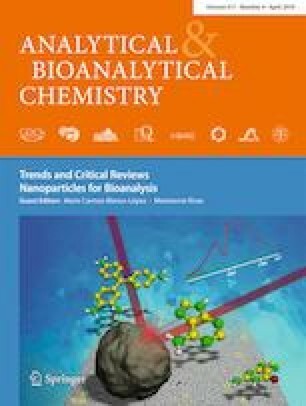 Yen CW, de Puig H, Tam JO, Gómez-Márquez J, Bosch I, Hamad-Schifferli K, Gehrke L. Multicolored silver nanoparticles for multiplexed disease diagnostics: distinguishing dengue, yellow fever, and Ebola viruses. Lab Chip 2015;15:1638–1641. doi: https://doi.org/10.1039/c5lc00055f.